This post doesn’t have a lot to do with personal finance, although it’s tangentially related, and if you’re into personal finance, you’re probably into general life organization as well (or, at least, you aspire to having an organized life). I’ve been meaning to post a link to this for almost a week now. Simple Notebook has a good, concise post up, highlighting The Lost Rule of Organizing: Know when to stop. The photo here is the “after” photo of her kitchen’s utensil drawer. 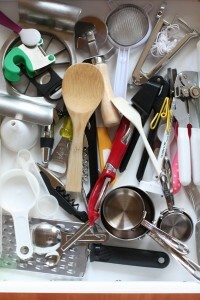 As she notes, she could have taken time to get every utensil sorted into a specific tray, or even just lined up nicely. But the crucial steps were to clean out the drawer enough so that she could get to everything she needs. Once she got to that point, she stopped.